So ran the small, slightly sarcastic piece of local news in an early April edition of the Times, profiling a man who has subsequently become the byword for creating extreme mutations of common animals to serve his purposes. In this case, the animal in question is of course no ordinary rodent. This is the T23: cross-bred, irradiated, hormone injected and genetically engineered to produce the Hyper Intelligent Giga-Hamster, or HIGH for short. As it turned out, this entire stunt served admirably to promote Dr Chomestoru’s stunning telepathic developments. 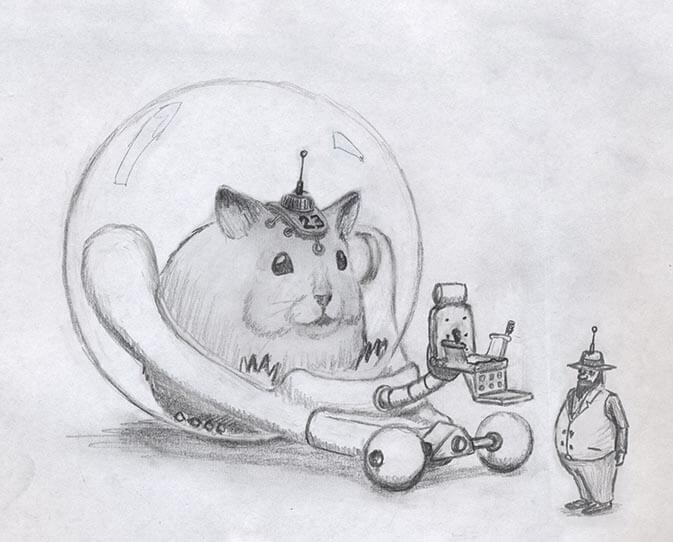 Shown here modelling his “Type II Electro-Neuro-Chapeau” he conclusively proved it was possible to communicate with another consciousness using the human mind alone (2 type AA batteries required) and Hibert was the first of many such creatures to achieve a new and much deeper bond with their owners. Almost overnight, the good doctor became a household name (even though most people were unable to pronounce it) and although unkind observers have been heard to note that as time goes by he has come to resemble a hamster himself, Dr Chomestoru was a benefactor of many charities, and generally liked. As for Hibert, he became something of a celebrity himself, with televised appearances and playing small roles in various films. With his fortune assured, he finally opened a health club (the Hamster Wheel with its literally revolutionary running equipment). In later years he was much more reclusive, although everyone will remember the scandal of his court case: suing a well-known plastic surgeon over a failed Botox treatment for sagging cheek pouches. Footnote: the so-called “Clever Hans” effect, or, in this case perhaps, “Clever Hamster” was widely touted as the explanation for Hibert’s so-called intelligence. But in fact he did possess a considerable intellect of his own and was deemed autonomous by the legal authorities. This is one of you best so far! Great job! This one is a HIGH-ly interesting page of the Codex. Brilliant (but I’m still wondering for the poop pollution concern. Hibert was very carefully trained to “hold on” when inside his ball. In fact I believe it was a matter of some pride that his ball was always immaculate. is there any further reference to Hiberts film work in the codex?? i would be interested to hear more. I would not be surprised to find that Hibert’s film work is mentioned later in the book. We shall just have to see what is revealed. We must have Class 3 clearance..